I know I have already featured Derek Jeter twice on this section of the blog, but he is hitting too well to not get recognized. He’s hitting .381/.403/.576 in August, and a staggering .468 BA since Aug. 10. Somehow he went the first 21 games of August without walking once, but he has walked four times in the last six games (including the intentional walk yesterday). The strong month puts him right back into contention for the MVP award, especially since Joe Mauer has hardly produced since Aug. 19. Then again, Jeter may not be the best MVP candidate on the Yankees, as Mark Teixeira has also been a strong contributor to the Yankees success. 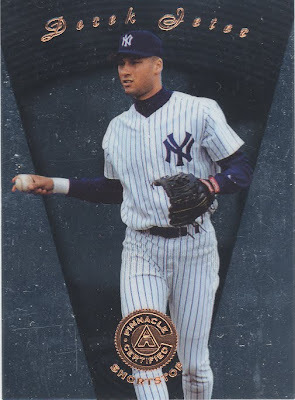 This card is part of the 1997 Pinnacle Certified series. It’s a pretty neat card too because the back of the card chronicles his 1996 season by opponent. So you can see his BA/H/RBI/HR statistics against all of the teams he faced.